Growing up in a divorced family can cause the children to have difficulties in maintaining relationships. 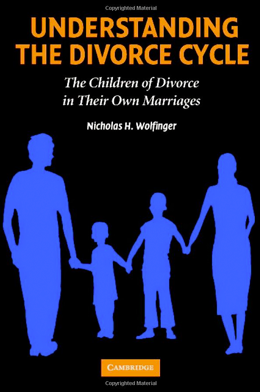 Nicholas Wolfinger demonstrates the significant impact of parental divorce upon people’s lives and society. The divorce cycle phenomena ensures the transmission of divorce from one generation to the next. This book examines how it has transformed family life in contemporary America by drawing on two national data sets. Compared to people from intact families, the children of divorced parents are more likely to marry as teenagers, but less likely to wed overall. They are more likely to marry other people from divorced families, but more likely to dissolve second and third marriages, and less likely to marry their live-in partners. Read more or purchase here.